I finished all the squares for the blanket and while doing it have been thinking about how I was going to join them. I’m not fully decided so I may do a few and see which I like best, so really the picture is the same as last week. I didn’t work any more on the hat preferring to work on the blanket and get it finished. I’m thinking of doing one for each of the girls and probably boys so I might just wrap this in tissue and give them to the children this Christmas, yes yes I know I mentioned the C word but when you’ve 8 and the thought of lapghans for each you have to start early! If I’m hooked up with you on facebook you may have noticed that on a new design project I was working on legs for most of the week, fiddly things that they were. Well I finished them, attached them to a new design and although I can’t show you new design just yet I can show you the legs. 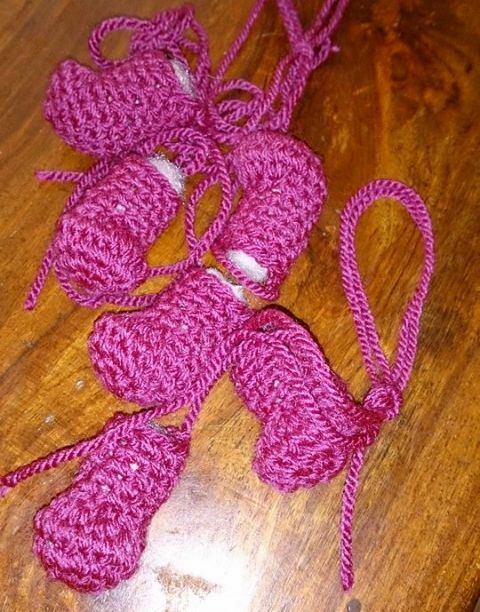 For these legs I was using an acrylic yarn and I went down to a 3mm hook size to have a tight stitch. The project I was working on needed the pliability of the acrylic that wasn’t there with the cotton which as you know can be quite stiff and it got me to thinking about why ami’s are worked in cotton more than acrylic or are they? The colour choice is much vaster in acrylic but I suppose the stitch definition is not there. I wonder which holds up better over time? Work this week will proceed on the blanket and I need a sample of Rose and Sam to take to a course with me later in March so I might work on those, who knows. Dominic our second eldest though does make his confirmation later this week and Dominic, Alan and Caoimhe are all in the next stage of a nationwide table quiz for school children. Dominic is on the older team of 4 and Alan and Caoimhe on the younger team of 4 and both of their teams qualified. So crafting time may be a bit sparse but no doubt a project will go with me in my bag to the quiz. Lovely squires for the blanket. I will be interested in how you choose to attach hem. I am looking for different ways to attach squares. Deciding which method is hard so I think I’m going to have to go with what I want the final look to be. Right now I’m finishing threads on those squares. I had finished as I went but now have a few from the last colour add and it’s taking time! I don’t use cotton much as it’s too stiff for my hands. Perhaps cotton doesn’t pill. Glad your kids are healthy now. Your squares are eye candy. Is that for the Evelyn beauty? Yes I’m thinking Evelyn although she just doesn’t strike me as a pink girl Elizabeth is, Evelyn has always seemed to be wearing more red so perhaps there shall be a change about. Yes the acrylic is pilling certainly on Benjamins little alien but I can’t help feel it’s giving it more of a loved look. I like the feel of acrylic so much more. The blanket is going to be fabulous and good luck on completing 8!! Intrigued by the feet – a bug by any chance!? Nothing like “a leg up” I say! So glad the kids are feeling better. My grands have been ill also…it’s everywhere, it’s everywhere. Those squares are so sweet. I want one for me. Congrats to your children on their being chosen. Wish them luck from me. It’s not too early for making gifts. I have so many to make for all year long that I pray some day I will catch up. The children are so appreciative too…they never see my mistakes. I’m also wondering about the cotton vs. acrylic.. I always thought cotton was considered ‘better’, but doesn’t cotton also pill? If you come to a conclusion, please let me know! I’m loving the pink leggies so far! I can see on the original Flora I did in cotton that it indeed may pill also just probably at a slower pace than the acrylic. 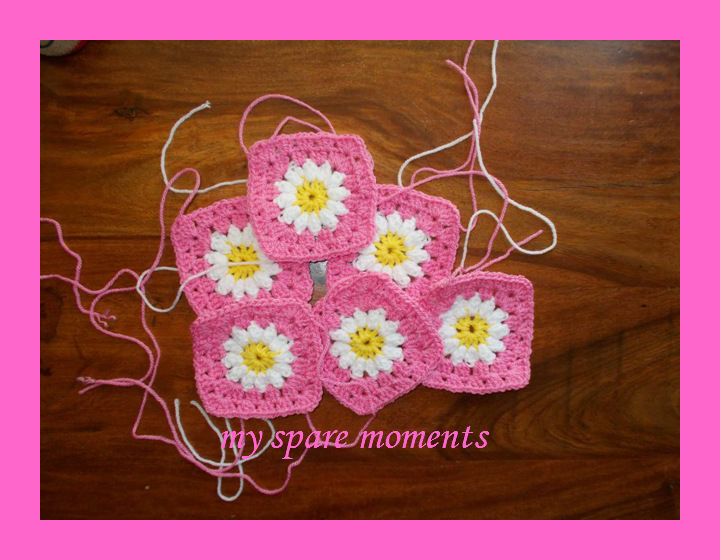 Lovely daisy squares, so pretty! I like working in cotton becauseof the stitch definition, although some how to me it doesn’t ‘bed in’ so well when you tie in the ends, I always all my ends going ping all together and the whole item unravelling! Your kids sound like they are doing well….go them…bet you’re a proud mummy! I seem to have lackedrecentlywith having a project to take out, its certainly tells on my finishes, I must get back into the habit!